Environment: Windows 7 Enterprise SP1 64-bit, SQL Developer 4.1.2.20.64 with JDK 8 included. I downloaded version 4.1.2 of SQL Developer from http://www.oracle.com/technetwork/developer-tools/sql-developer/downloads/index.html, I selected “Windows 64-bit with JDK 8 included” from the list. I was confused. 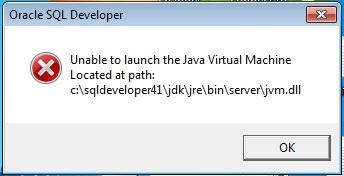 The file MSVCR100.dll is part of the included Java Development Kit, so why wasn’t SQL Developer able to find it? I never had an issue like this with previous versions of SQL Developer (I always choose the version with included JDK to avoid Java issues like this one). it is the best way to fix the error!